The premise of this exhibition at the Morgan Library and Museum is to present a painting discovered in 2009 and posited to be the only known portrait of Shakespeare painted in his lifetime, as well as the “prime version” used for many derivative paintings. 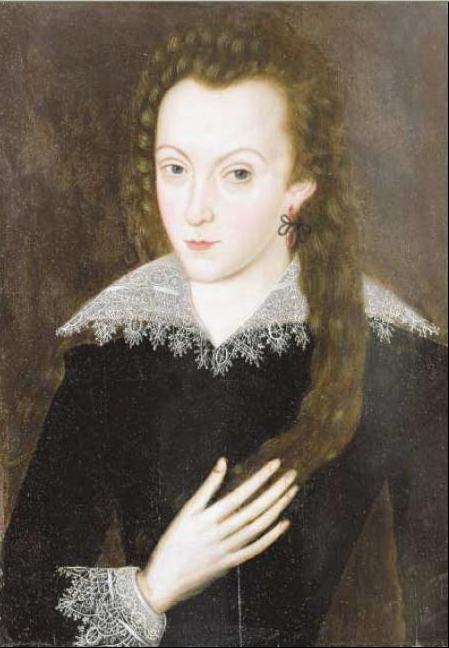 Called the Cobbe portrait after the family who owns it, the portrait is shown with another recently identified portrait, that of Henry Wriothesley, 3rd Earl of Southampton, who was Shakespeare’s literary patron. The exhibition is contained in one square room, about 25 feet long per side, with high ceilings. Upon entering through glass double doors, the introductory text is immediately to the left (on the north wall, flush to the doors). After reading the text, visitors will likely follow the walls of the room clockwise, proceeding to the dedication and Wriothesley portrait on the west wall. On the south wall, directly opposite the double doors and therefore the focal point upon entry, is the Cobbe portrait, flanked by the printed arguments for and against its “primary version” status. On the west wall are three derivative portraits of Shakespeare, and on the remaining north wall area are three engravings. The center of the room contains two glass vitrines of equal height. One holds two books, while the other contains the queen’s gift roll. As a one-room exhibition whose objects are few and focused, visitors can take any path and still experience the show cohesively. If a visitor’s time is limited, the Cobbe portrait is immediately recognizable in its showcased position on the south wall. Aside from the introductory text and dedication page facsimile (enlarged to clearly show the folio typeface and conventions) the arguments “for and against” the Cobbe portrait comprise the other large areas of wall-printed text in the exhibition. This clever and effective presentation appears on the focal south wall. The exhibition title appears in large font above the portrait. The supporting case, to the left of the portrait, is introduced with the instantly recognizable phrase “To be,…” followed below by seven short paragraphs offering evidence, whose headers (in all capital letters) are: The Prime Version, The Proliferation of Copies, The Droeshout Engraving, The Hair (Or Lack of It, The Cast to the Eye, and The Inscription. 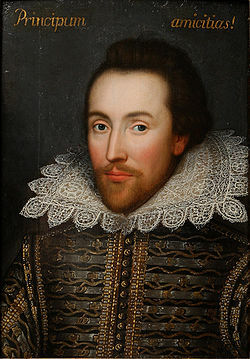 On the portrait’s right side, the famous phrase is continued “…or not to be” as a header, followed by four paragraphs with reasons cited by Cobbe portrait detractors (again these appear in all capital letters): The Sitter Looks Too Young, The Sitter is Too Richly Dressed, The Folger Shakespeare Library Copy Was “Faked” into a Portrait of Shakespeare by Overpainting the Hair with Baldness around 1777, and In 1964 the Sitter in the Shakespeare Birthplace Copy was Identified by David Piper as the Minor Courtier Sir Thomas Overby. The font size used for the paragraphs on this wall was small in comparison to the didactic labels and could have been made larger without diminishing their visual “pedestal” to the Cobbe portrait. The overall design of the exhibition is visitor-friendly and attractive. The exhibition room, directly off the Morgan’s central lobby, catches a visitor’s eye with two large squares (a portrait and the show’s title) above its glass double doors. Inside the room, a neutral palette is utilized which shifts from dark to light upward: gray-brown bases and object supports for the vitrines; beige walls (up to a line at the height of the doors, with off-white paint above), and signage in black (labels and didactic text) or maroon (titles and headers) lettering. The font used for the title and the famous phrase from Hamlet evoke the folio typeface of the dedication page facsimile, furthering the exhibition’s aims to contextualize and interpret past and continuing scholarship on Shakespeare’s representation. Inside the two vitrines, labels and didactic text are mounted at a slight angle to facilitate reading. Appropriately, the technology used is minimal and subtle (the enlarged facsimile page is the only “enhanced” object in the exhibition) and the groupings of engravings and paintings communicate to visitors the “chapters” in the narrative and premise of the exhibition. Visitors seemed very engaged with all objects on view and many viewed certain objects more than once. Attracting the most attention were, understandably, the Cobbe portrait and that of young Wriothesley (whose portrait is likely provocative to contemporary viewers with its ambiguous gender cues). The gift roll bearing Queen Elizabeth’s signature was also well-circled, while the engravings’ monochrome and smaller size seemed to hold viewers’ attention less well. Some visitors spent only a few minutes in the room, being perhaps in a rush or misjudging the value of the show by its modest physical footprint. But most visitors lingered for at least fifteen minutes in the room, reading each didactic label, studying the portraits and objects, and discussing with others what they saw. I enjoyed the specific focus of the exhibition, the physically enclosed space, and the sense that each object was absolutely essential to the “why?” of the exhibition. It successfully met its stated aims, and left me with a strong awareness that scholars are far from general agreement about facial representations of Shakespeare. Staying in the room for over two hours at a stretch was made more comfortable given the absence of any security guard. I recommend this exhibition to anyone with specific interest in Shakespeare or literary scholarship. This entry was posted in Exhibition and tagged Henry Wriothesley, Morgan Library & Museum, William Shakespeare. Bookmark the permalink.